TOKAJI.com .::. 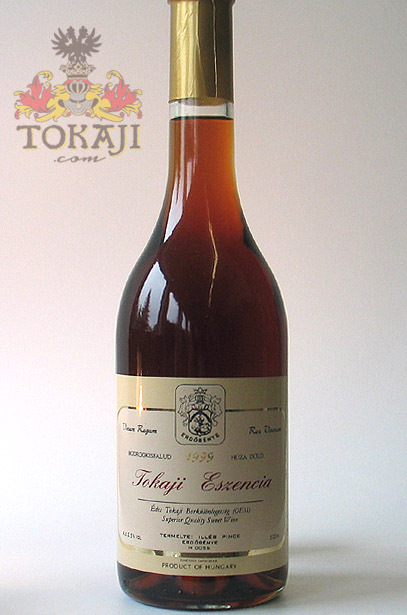 Buy Tokaji Essencia : 1999 Tokaji Essencia "Huza dülö"
You are here: Home BUY TOKAJI Buy Tokaji Essencia 1999 Tokaji Essencia "Huza dülö"
Genuine Essencia from the outstanding 1999 vintage, from the vineyard Huza-dülö on the slopes of Várhegy, where once Prince Rákóczi, Count Waldbott and Count Falkenheim had their vineyards. Várhegy near Bodrogkisfalud, with some ruins from the Ottoman time on top, is very rich in minerals. Today, its sidetracts Barakonyi and Huza-dülö are treated as individual vineyards as well. The hill has been property of the Rákoczi family. Later, after their defeat in 1711, Baron Waldbott was the prominent new owner. The Austrian-German Waldbott family became a major owner of vineyards in Tokaj-Hegyalja, with 160 hectares spread throughout the region. They also acquired the huge Rákóczi cellar at Erdöbenye, which is partly owned by the Illés Pince winery today. After phylloxera at the end of the 19th century, Baron Friedrich Waldbott was a leading figure in the construction of Hegyalja, and had nearly half of his vineyard area replanted with American root-stocks. The sidetract Barakonyi on Várhegy is the famous part of, it was mentioned to be one of the village's two tracts that produce the most outstanding wine. Huza-dülö is the southeastern sidetract of Várhegy, and was probably part of Count Falkenheim's property on Várhegy.